The St. Louis Blues may have finally figured out the correct way to end the regular season as they sit tied for first in the star-studded Central Division. They are currently on a five-game winning streak, which ties their longest such streak this season (they have had two other five-game win streaks this year), and are poised to make a solid playoff run if they can keep their recent playing levels up into the postseason, and get healthy before the true test begins. Despite having the most injuries to ‘top tier’ players (606.28 IIT-CFRel, 2. MTL at 546.13) the Blues have not missed a beat all year. They have managed to limit their losses throughout the season and have even kept pace with the high-octane Dallas Stars, who seemed to be running away with the division at this season’s midpoint. The Note have also been able to find ways to win consistently, only losing five in a row once in early December, and only losing three games in a row a couple of times throughout the year. This perseverance is what has given them a chance at a second consecutive division title, and more importantly, favorable playoff seeding. 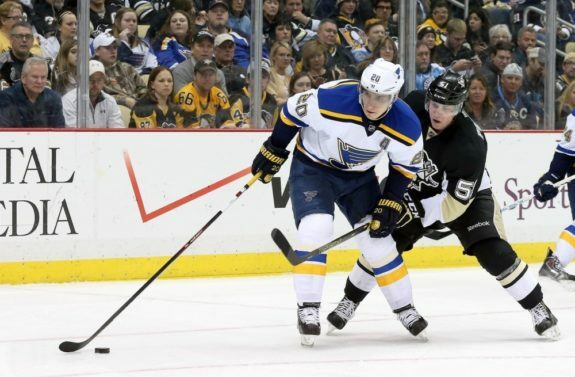 Alexander Steen was welcomed back as he registered two assists in his first game back from a 15-game absence (Charles LeClaire-USA TODAY Sports). In addition to the team meshing together and finding ways to grind out wins, they have been impressive against top competition in the Western Conference, a sticking point with the players and staff this summer. In previous years’ past, the Blues have done extremely well against Eastern Conference opponents but could never seem to replicate that success against foes in their own conference. However, this year the Blues are an NHL-best 31-12-4 against teams in their conference showing that they are focused on finally getting out of round one in this year’s playoffs. They have also been able to find that balance between playing reckless and cautious, which has led directly to better decision making and more chances for the entire team. “(Our style is) too conservative, it’s too careful, it’s too much skill ahead of work,” he said. “We’ve got to get back to reckless. We’ve got more skill than we’ve ever had since I’ve been here. But skilled, careful hockey doesn’t win. You’ve got to play reckless. We need to get back to the reckless play we had before. That’s what Doug and I talked about. You can do it and still be responsible. But we’ve got to get back to reckless play. We’ve got to ask more people to be involved offensively and defensively.” – Ken Hitchcock in a late May 2015 interview chatting about looking ahead to 2015-16. For the majority of the season, the Blues have relied heavily on their goalies, Jake Allen and Brian Elliott, to steal wins and keep them in games with numerous ridiculous game-saving stops. However as of late the tendies have finally been getting some offensive support as the team continues to gel into a formidable scoring threat. Since February 28th (13 games) the team has averaged 3.77 goals-per-game while only allowing 2.23 against (also per game). That shows that the team has really been focusing on playing a 200-foot game where defense breeds opportunistic scoring chances. This is the exact style of play successful playoff teams employ, and it’s great to see the Blues finally figuring this out in 2016. Jake Allen and Brian Elliott have been stellar for the Note this season (Jasen Vinlove-USA TODAY Sports). Though Ells and Allen are still largely accountable for the recent success, especially after a four-game shutout streak that lasted 258:29, the team is clogging the middle of their zone well and have necessary back-checkers focused on the developing play around them, not just the puck. These are all signs of a team primed to have playoff success and are also team characteristics that have been lacking in recent years’ past. In addition, Coach Ken Hitchcock’s line juggling has settled some, allowing players to become more comfortable with one another which has led to the increase in goals-per-game, and simplification of plays in the offensive zone. The team is now getting dangerously good at reading the developing play and not overthinking things as they develop. This has led to a ton of scoring chances, and pretty plays that boost the entire organization’s morale despite an injury bug that just won’t go away (Tuesday’s contest against the Colorado Avalanche saw defensemen Jay Bouwmeester and Carl Gunnarsson miss for a second straight game, and rookie star Robby Fabbri go down with a lower-body issue). Lastly, the Note’s special teams have been tops in the league since the All-Star Break. Their power play is actually ranked second overall at 26.7% (20/75), and their penalty kill is tied for ninth at 84.8%. There is one other factor that has helped the Blues keep rolling into the Spring, and it’s not what many may think. 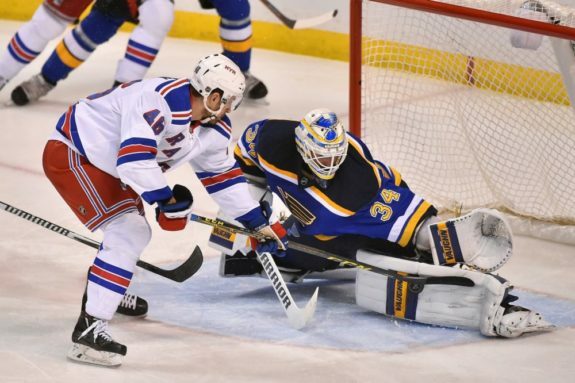 Though the team’s heart has shone through this season, recently the Blues have been given some ‘extra support’ from the league and the Scottrade Center, indirectly of course. Historically the Blues have had one of the tougher schedules from January on, due to events at their home arena and NHL scheduling blunders. The team is usually in the top 5 in the league for strength of schedule, number of games, and total travel as the season winds down, however, this year only one of those three problems continued. The Scottrade Center didn’t hold nearly as many early Spring basketball tournaments as it usually does, allowing for more home games down the stretch (meaningless lengthy, draining travel for the team as a whole). Also, the NHL managed to schedule the Blues evenly throughout this season, giving the team some relief from a ton of games in a short period of time leading up to the playoffs. This has certainly helped the team get healthier, and has also helped them maintain their consistent play heading into this final five-game stretch. The team will truly begin their playoff journey this Friday when they play the Boston Bruins at home, followed by two games against the Avs and the Arizona Coyotes before they finish off the year against the rival Chicago Blackhawks and soon-to-be President’s Trophy winners, the Washington Capitals. Though the end of the year is a tough stretch, the team still has plenty of off-days to rest up and get healthy as they get focused on a deep playoff run, something the organization and its fans need to see to avoid a catastrophic situation in the Gateway to the West.